Osaka has 2 big and busy areas,Kita and Minami. Minami is one of them.In general, it points out the area near JR line, Kintetsu line ,Hanshin line, Nankai line,Subway Nambastation. When you say Namba, it is usually the area very close to the station. Tourist find it very convenient in transportation to the airport as well as walking around popular sights. A bustling area representing Osaka. There are many restaurants which serve you something cooked with flour based such as `okonomiyaki`,` takyoaki`,`udon `in this city. 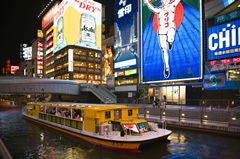 The Ebisu bridge just got renovated and re-created a promenade named `Tombori river walk`and there is even a small port `Aqua mini`.it takes you around from Osaka castle part through Dotombori, Minatomachi river place,you can enjoy about 50 minutes cruise ride. A popular spot for taking a picture is in front of this Glico or big Crab billboard. This is a place with a lot of atmosphere of Naniwa,Osaka. 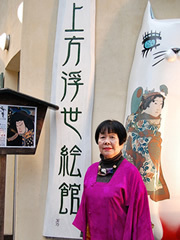 It is well-known as a play `meoto zenzai` written by a novelist Oda Sakunosuke. 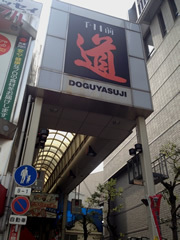 Yokocho has many kind of Japanese restaurant , fancy bars, reasonable kushikatsu, and okonomiyaki restaurants. 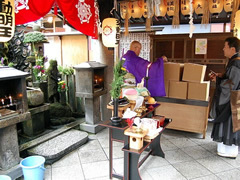 You will see `Ofudosan(acala)`covered with a full of moss behind a stone pavement.Please stop by and feel the history. Basically `Kamigata Ukiyoe` is one of the Ukiyoe which were painted the most in Osaka between Edo Era and the beggining of Meiji era. The difference between other Ukiyoe and Kamigata Ukiyoe is ,Kamigata Ukiyoe has more focused on painting some Kubuki actors of Dotombori.towards Ukiyoe.Ukiyoe is more focused on painting scenery or beautiful people. Kamigata Ukiyoe is very realistic and from the paintings, you can imagine a life of old days.Now days, it is housed in overseas. You can experience how to make ukiyoe here with a reservation in advance. 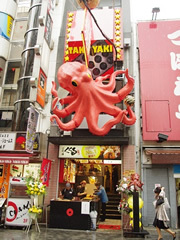 It has all things konamon, or "flour based food", including takoyaki and okonomiyaki. On the first floor, visitors can watch Takoyaki experts and eat the takoyaki .And on the third floor, visitors can try their hand at making their own Takoyaki samples.so you can bring them back home as your souvenirs. It was originally opened in 1923 as a Neo-Renaissance style theater, the first western-style theatre in Japan. 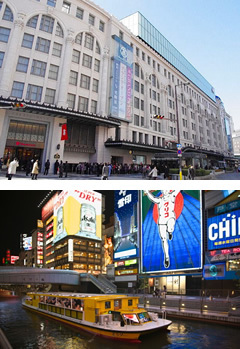 It was rebuilt in 1997 incorporating the large Arch in the front of the building, You can enjoy a variety of performances ranging from kabuki to musicals.A lot of of stores on the basement. The theatre has two halls. The Large Theatre has a capacity of around 700 seats depending on stage setup, and is primarily used for performances of bunraku,as well as Buyo and stageplays.Bunraku is consisted from 3 things as Joruri teller, shamisen player,traditional puppet. They have this very special way of moving 1 doll by 3 people,you can see how things are going. 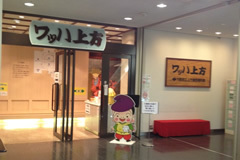 In the Small Hall are performed other type of traditional arts such as,rakugo, manzai and Japanese music. 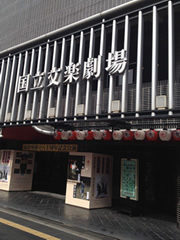 Namba grand kagetsu(NGK) theater is the headquarters of Yoshimoto.a unicersal brand of Japanese comedy. You can Vandecille-like comedy performances such as Shinkigeki, Manzai,Kontos and Rakugoevery day twice a day(sometimes 3 times with the evening program,and 3 times on Sundays and holidays). The theater puts on performances all year round without any days off! 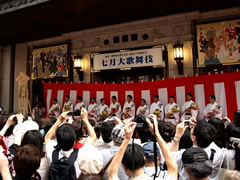 This is a history museum of ｀warai（laugh).`it is located in front of Namba grand Kagetsu. There is a milkhall with some classy atmosphere and a pub inside the building.It reminds you some old periods. The arcade 580m long. 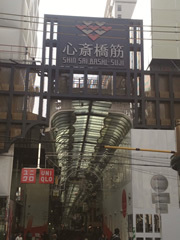 (from Nagahori street to Souemon machi ) There are about 180 shops in the arcade from traditional old ones to the modern newest ones. There used to be many book stores or clothes,stationary shops. But they turned into big department stores and now days the arcade are packed and busy all day long with young people. A concrete rest area surrounded by retail outlets of Western fashions, bars and nightclubs, some of which are run by Westerners. Ame-mura is known for being a place for observing some of the more `fashion intense` manifestations of Japanese hiphop culture.You enjoy some used clothes shopping or music performance and flea market in the triangle park. 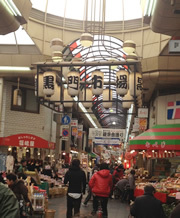 Sennichimae Doguyasuji shopping street is line with specialty stores of all kinds of cooking utensils and kitchen items. Oskais called the `kitchen of the world` where lots of chefs worlk with highly trained skills. Stores stocking tools accommodating such professionals congregate in Doguyasuji. The market has a total length of close to 600meters with 170 shops.the vast majority of which specialize in the freshest and best quality meat, vegetables,eggs and other ingredients from around the country and abroad. It is pretty bustling everyday especially at year end and new year holiday.You see that fuss on the news sometimes. 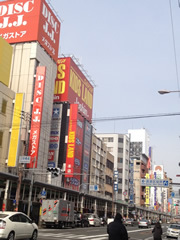 It is one of the largest commercial districts in Osaka.packed with electrical equipment discount stores. You can also find some rare item or toys. People laden with shopping bags occupy the street on weekends and holidays. Ask the tourist information if you get lost!